The Veeam Agent for Linux user interface shows R (Recover Files) at the lower edge of the window. 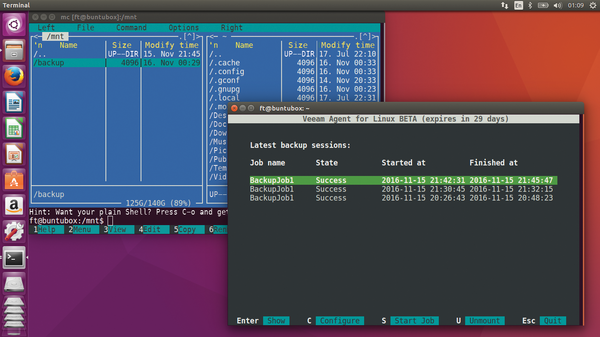 After pressing R, you will see a list of available backup jobs, provided backups do in fact exist. In the function bar, the I (Import Backup) function lets you choose the backup to recover. The Veeam agent mounts the selected backup under /mnt/backup/ (Figure 5), which leaves you free to choose your preferred tool for restoring files and directories. For example the Midnight Commander tool on the console is a possibility (Figure 6), or you could use a graphical file manager. Figure 5: When recovering data, the Veeam agent mounts the recovery files on the system under /mnt/backup/. Figure 6: With the help of a file manager like the tried and true Midnight Commander, you can restore files and folders. If you want to restore a complete system, instead, you need to start up your computer from a Live image. A recovery system in the form of a 75MB ISO in the original download folder can be used for this procedure. You should burn it to a USB stick and use it to boot the computer . 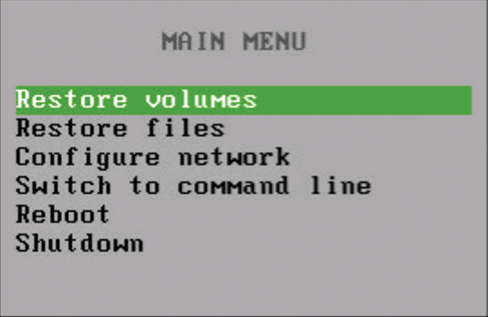 The recovery image starts automatically in a GUI and offers options similar to those used in the tests, including Restore volumes (Figure 7). Because the backup is on NAS, I entered the same address I did in the beginning when creating the backup; then, I selected the backup I wanted to restore and started the process. Veeam overwrote the system installed on the computer, making it bootable with the selected backup. Figure 7: Veeam Agent for Linux uses a Live image to recover a system backup. 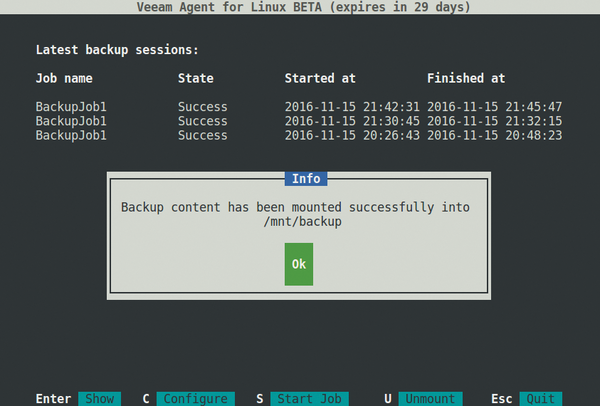 Veeam Agent for Linux brings a convenient backup solution for local and remote instances to the marketplace. The product demonstrates that the manufacturer has the skills and experience required to make it a success. The developers deliver intelligent solutions, such as allowing the user a free hand in choosing the recovery tool. The Veeam agent has been designed to target customer organizations that will potentially spend money on other Veeam products in the future. A mature product is a prerequisite for success with this marketing technique, something that also proves very advantageous to users of the free Veeam Agent for Linux. The software provides a professional setup for creating backups locally in the private network and on servers in the cloud. Although the software is still in beta, it was able to complete all of the tasks assigned during testing brilliantly. Both the recovery of files and folders using a file manager and a system restore using file images went off without a hitch. Extensive documentation  is available for the beginning steps, and additional information is available in a well-visited forum . Users of Windows Server 2012 will benefit from numerous innovations, especially in the areas of virtualization, high availability, and storage. In this article, we show you some tricks that make handling the new system much easier. Redo Backup backs up complete hard drives locally or over a network. The focus is on simple operation and high reliability in a variety of deployment scenarios. The free Duplicity backup program consistently encrypts all backups, which means that backups can even be stored in an insecure cloud.